I’d been to the Drovers Dog in Indischebuurt several years ago and had a mixed experience. Then I went back a couple of years ago and things had improved considerably. The Wibautstraat branch is even better, and the servers practically know us by name there already. 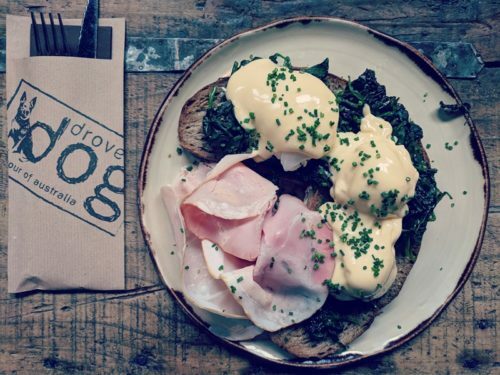 It seems to be nigh-on impossible to find Eggs Benedict made with proper English muffins in Amsterdam, and Drovers Dog is no exception. However, at least they mount their eggs on strong toasted sourdough (rather than brioche or bao buns – yes, I really have experienced this!) and the rest of the dish is stellar. Excellent Hollandaise, a generous amount of buttered wilted spinach (although a slightly less generous amount of ham), and perfectly cooked eggs. The coffee at Benji’s is some of the best on the Wibautstraat. And their brunch and lunch options have a healthier bent than their Antipodean counterparts next door. 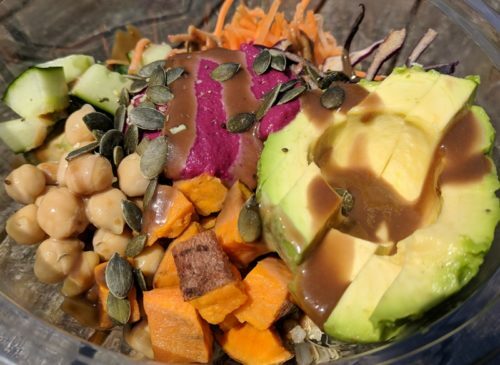 So far, I’ve only tried their Buddha Bowl – a rainbow salad of quinoa, avocado, hummus, beetroot, sweet potato and chickpeas. My only criticism is that the dressing didn’t run through the salad – it only rested on top. But it was a decent enough bowl that I’ll be back to try more. Serving only vegetarian and vegan dishes, Beter & Leuk is a breakfast and lunch café that leaves you feeling virtuous as well as satisfied. 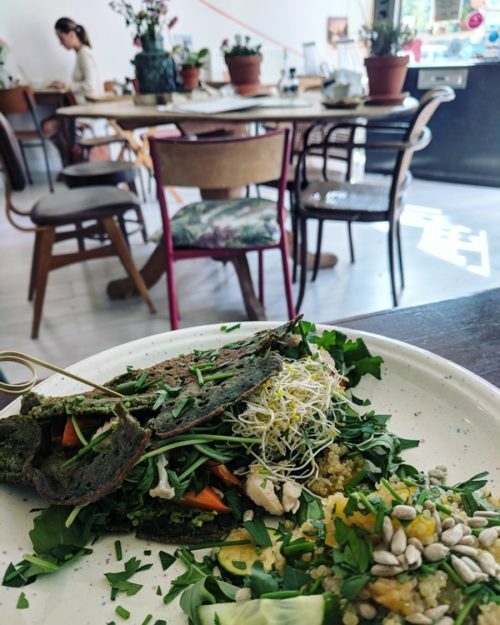 While my friend reported good things about the smoothie bowl, I tried the spinach pancake that was stuffed to the brim with roasted veggies and green hummus, and served with a nutty, fresh quinoa salad. To drink, I opted for a kombucha soda that was a bit odd (sweeter and fizzier than I’d want my kombucha to be) so next time I think I’ll try the coffee instead. We took home a couple of slices of banana bread for an afternoon snack later, and they were pleasantly moist and well spiced. My only criticism would be that the service was fairly slow, but if you’re not in a rush then the atmosphere is relaxed and gezellig. From one of the brains behind the popular BAUT concept, Restaurant C adds bold flavours and playfulness with temperatures from Chef Arnout van der Kolk – both of which make this place one of the best eating experiences in Oost. The five-course menu will set you back €55, but you’ll want to get the wine pairing as well for another €38 (a la carte options are also available). 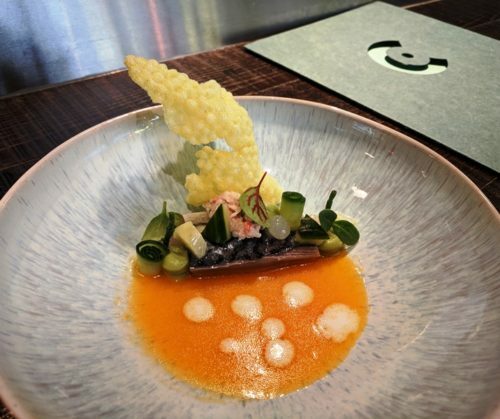 It’s well worth the price tag, however: some of my favourite dishes included raw mackerel and cucumber, yuzu gel, saffron kroepoek, and a spicy-sweet-citrusy sauce. Or clams and razor clams served with several varieties of seaweed and an umami-rich foam. Be sure to sit at the chef’s table at the bar (especially if there are only two of you) for a behind-the-scenes peak into the kitchen. Read my full review here. I visited Rijsel around a year ago, and would happily go back to its converted schoolhouse interior for some of the kitchen’s much-touted rotisserie chicken. Mine came with cubes of roasted root veg, dressed butter lettuce, and seasoned roast potatoes with mayo. It’s sort of posh comfort food. Meanwhile, one of my table mates tried the onglet (hangar steak) and reported it to be tender and tasty as well. For the less carnivorous, there are actually fish and vegetarian options as well – but most people go there for the chicken. Read my full review here. 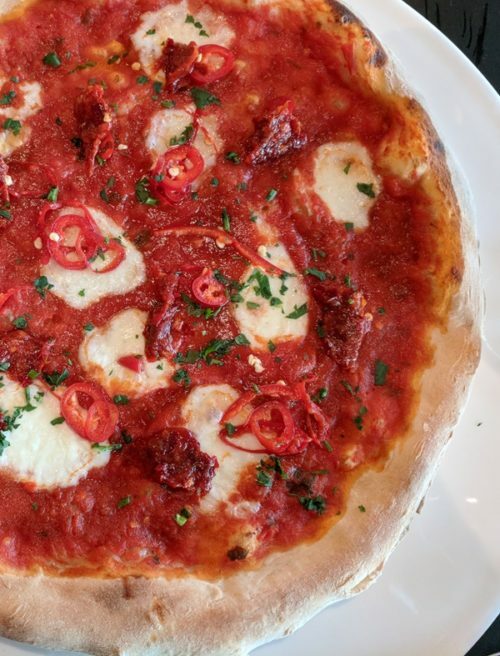 Right around the time we got the keys to our new place, I happened to read about The Commons’ ‘nduja chilli freak pizza – and since I’m a total chilli addict it was first on my list to try. We prepped ourselves with a couple of beers on The Commons’ sunny terrace, and then got stuck into the pizza challenge – so hot (apparently) that it’s served with a glass of milk. 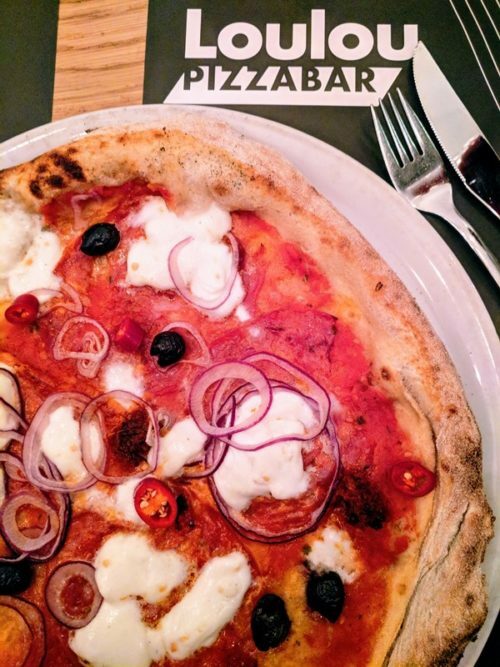 The €10 pizza came topped with a spicy tomato sauce, ‘nduja sausage, and fresh red chillies (plus cheese, of course) – and I’ll admit that it was genuinely, properly hot. As pizzas go, it wasn’t the best – the crust was a little thick, not quite crispy and a tad sweet. But I admire the chef’s decision to own all that chilli heat and make this pizza their signature. Read my full review here. Want to eat elsewhere in Amsterdam? Download my comprehensive Amsterdam restaurant guidebook here. LouLou’s was probably my first experience of the miracle that is getting reservations in Oost: the day before my birthday, I emailed to ask for a reservation for 12 people the next evening. It was a Friday night on the banks of the Amstel, and they fitted us in – just like that. The pizza tasted pretty good too: of course, I went for the Diavola (the spicy one), which was rather sparse on toppings. As in, I got three tiny acorn-sized splodges of ‘nduja, even less of the salami, and the thinnest of layers of tomato sauce. For €15.50 (it was one of the most expensive pizzas on the menu), that seemed rather steep. However, others in my party ordered other pizzas of course, and they were far more generously topped. My BBQ buddy Jeroen got half a deli counter’s worth of San Daniele ham. And the house wine and the service were impeccable. So I’ll be going back to LouLou’s – I just won’t be ordering the Diavola. Somehow, Greek restaurant Athene has been doing business beside the Amstel for yonks – possibly because they have an idyllic pavement terrace that catches the evening sunshine with just the right amount of leafy dapple. It certainly isn’t because of the food, which was borderline inedible. Fried aubergine was flabby and oily in its batter jacket, while stuffed vine leaves were like hard little pellets. Perhaps as a result of being zapped to within an inch of their life in a microwave. For main, we split a lamb kebab, which comprised one skewer of dried up, leathery meat for around €20. Despite ordering wine, we had to pay a heavy premium for water (apparently water doesn’t come out of Athene’s taps as we were forced to order it bottled), and the service was surly at best. Greek food this is not – and neither is it Greek hospitality. New on the Amstel (not just new to me) is Cote Wispe: a classy looking eetcafe with good wine and craft beer as well as simple food like burgers, steaks and so on. 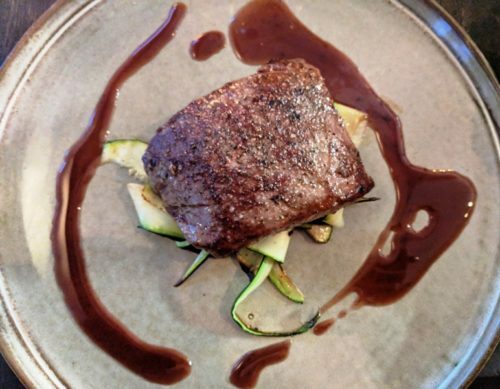 My steak was tender but a tad undercooked for medium-rare, and could’ve used a warm plate (especially since there hadn’t been much heat getting into the meat while cooking it). Speaking of lacking in warmth, my jacket potato was completely cold – to the point that I had to send it back and exchange it for chips. All that being said, I did like the atmosphere of Cote Wispe and would probably go back – but I’d advise keeping it simple and opting for the burger and fries. With one of the biggest terraces in Amsterdam, it’s amazing that Café Hesp’s Amstel-side service is as efficient as it is. In the last few weeks, I’ve been to Hesp twice: once for a late breakfast on a sunny Sunday, and again on a weekday evening for a drink and a light dinner. The omelette I ate on the first occasion wasn’t the best of my life, but it was significantly better than many of the sorry excuses for omelettes that I’ve eaten in Amsterdam before. (It was a shame it just came with sliced white bread, though). The beetroot and mozzarella salad, on the other hand, came with decent sourdough and was fresh, earthy and generous. And the service was impeccable on both occasions. Given its location on the way out of town down the Amstel River, Weesper was surprisingly bustling on the Friday night I was there. It was more surprising still considering how huge it is. Presumably the after-work crowd from the Amstel business park are Weesper’s core clientele, but it’s worth a visit for the meat alone. I particularly enjoyed their beef short rib: unlike others I’ve had that’ve been all bone and marinade, this one was seriously meaty. It came with a tangy chimichuri sauce and a few roasted veggies. Other sides had to be ordered separately, so we went with a green-bean and almond salad (also good) and a simple bowl of chips and mayo. 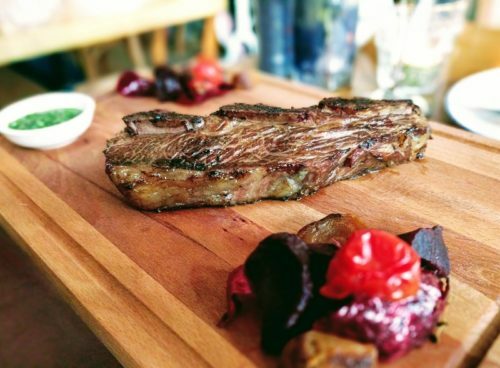 According to the menu (which also includes steak, burgers and pork chops), they chargrill their meat – which certainly showed through in the flavour of the beef short ribs. Read my full review here. On the Ruyschstraat between the river and the Wibautstraat is Italian restaurant Mangiassai. On walking in, there was a buzz of Italian accents, which seemed like a good sign. Unfortunately for us, however, it also meant that Mangiassai had already run out of several things on their menu. After waiting for what seemed like an eternity, we wolfed down our antipasti – bruschetta, mozzarella and prosciutto – all of which were pretty good. Mangiassai didn’t have the pizza I wanted so I ordered ravioli instead – stuffed with spinach, ricotta and lemon and served with a bright tomato sauce. It was probably the best dish of the three but was nothing spectacular. My friend’s concighlie with zucchini sauce and guanciale was a bit lacklustre (it needed lemon and/or salt), while Mr Foodie’s aubergine parmigiana was stodgy from all the breading and frying of the aubergine slices. On the plus side, dinner only came to €32 each including several drinks – affordable, but next time I’ll try the pizza. Le Due Sicilie is not quite between the Wibautstraat and the Weesperzijde, but it’s so very close and I loved it so much that I decided to give them an honourable mention here anyway. Not least because it’s a Sicilian restaurant with all the warmth and sunshine in their food and in their manner that you’d expect. So far, I’ve tried the pulpo, the swordfish and the ziti pasta – all of which were spectacular, especially when washed down with a well-rounded glass of Nero d’Avola. I can’t wait to go back to Le Due Sicilie for more; read my full review here.